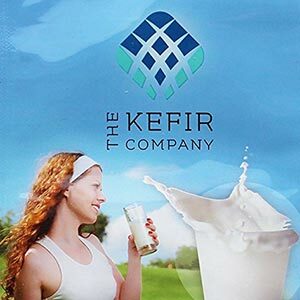 Kefir is one of the healthiest probiotic drinks with tons of health benefits. You should drink it every day for better digestion, healthier skin and bones, and even fight some cancer cells. Having kefir everyday can boost your immune system and cure some stomach problems such as leaky gut and lactose intolerance. This is why many people spend a lot on buying kefir from the supermarkets, but in reality, kefir can be made easily at home and virtually forever if you have the right tools and ingredients. Fermenting homemade kefir is very easy process. 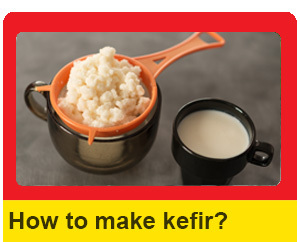 Once you start making kefir in your kitchen, it won’t take you long to be a kefir master. If you want to make this process even easier consider having these equipment which will help you a lot in the kitchen while making your own homemade kefir. 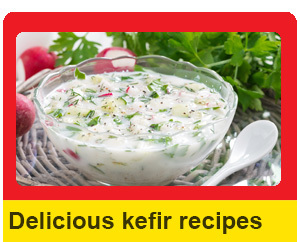 The very first thing you will need to make kefir is the live ingredient called the Kefir Grain. It is the “Starter” or the “Seed” that can be used over and over again simply because they multiply. Couple of starter culture packs are popular and can give you great value for the money. This is a 3 sachets of 5g starter grain packs that can make up to 100 liters of kefir. 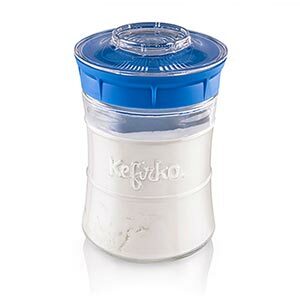 Containing seven strains of probiotics, this is kefir extracted from nature and stored in powder form. The grain can be shipped overnight within USA and Canada. The package also comes with an instruction manual on how to make kefir and store the grain after use. 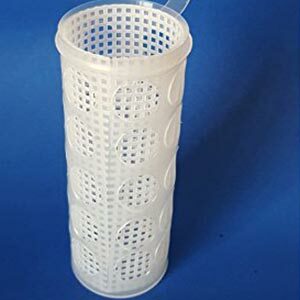 For an additional $8.55, this package can also be ordered together with 3 nylon mesh strainers. If you want to make water kefir this is definetely for you. Water kefir grains form Real Kefir is an amazing vegan starter culture that is used to make kefir from non-daily products such as soya milk, coconut milk coconut juice and other fruit juices. 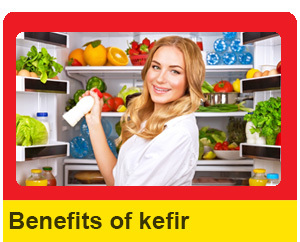 Real Kefir guaranties non-GMO and gluten-free starter culture that can make unlimited amount of non-dairy kefir. Package includes instruction manual. 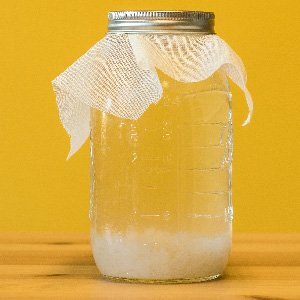 You can make your Kefir with the starters using any normal container of strainer in the house. However, since we are talking about how to make homemade kefir easily, there are some easy-to-make tools specially designed for homemade kefir making. These pieces of equipment will significantly reduce complications in making kefir at home. When you start making your own kefir milk at home, the hardest part is to strain your kefir at the end of the 24 hours fermenting process. Kit is complete with a glass jar, strainer lid, a swizzle stick and a juicer. The strainer lid acts more like a tea brewer. You can put your milk of choice and starter grain all at the same time inside the concave class jar. Once kefir is done (24 hours later), you can put the strainer lid on top of the kefir and use the swizzle stick to push it down to separate the culture. The culture stays at the bottom while you pour your kefir from the jar into the glasses. While you are not making a new batch, the culture can be left in the jar, so the jar acts like storage for your live culture. Kefir fermenter by Microbiota Inc. 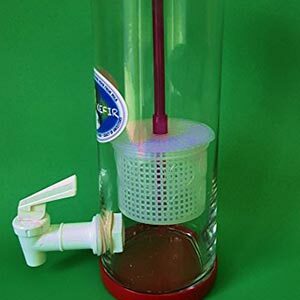 This is a fermenter that can be used with any wide mouth jar that you already have. It comes with a jar mouth cover and a culture holder suspended on a tube. The holder has large holes on the body to allow milk to enter and interact with the started culture. This package also includes a bio-friendly sponge with 20g Kefir starter in it. 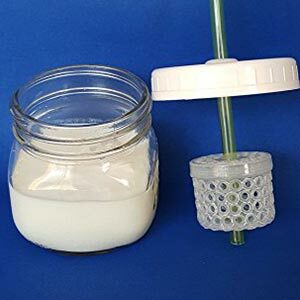 Simply fill a jar with your choice of milk of juice, insert the sponge into the holder, attach the holder on one end of the suspender tube and cover the jar with the mouth cover and you are live. Once done, you can remove the holder, fill another jar and make another batch again. This fermenter is another design of Mircobiota Inc., and in many ways, a lot more convenient. It is a 5” high and 2” diameter plastic container with a strainer that fits perfectly inside. Simply put your starter culture and milk together inside the jar, cover it and 24 hours later, you have perfect Kefir. Slowly pull the strainer out of the jar to separate the grain to be used later for another batch. This is an interesting product by Kefir Fermenter. This particular container comes with a suspended grain holder on a tube where the starter culture can be put. You can then pour milk or juice and cover to go live and have your Kefir in 24 hours, but this model also has a continuous Kefir making concept. The jar comes with an outlet at the bottom with a faucet. This way, you do not have to pull out the grain to make a new batch. Instead, you can drain the older batch out and refill the jar with new milk. Health is truly wealth. You cannot enjoy your money or car or even the company of loved ones if you are physically unhealthy. Your body is your temple and it is the first responsibility of anyone to take care of their health. What if you knew that one simple habit in the form of a glass of delicious drink can contribute to a good feeling, active, and vibrant body? What if one glass a day could keep the doctor away forever? Would you not take the chance?